• Overall Dimensions: 918 mm Height x 300 mm Dia. • Suitable reinforced to promote long life and to prevent damage during handling, transportation 8 erection. •The bollard is provided with four Nos 12 mm dia for steel bards for anchoring to the ground. 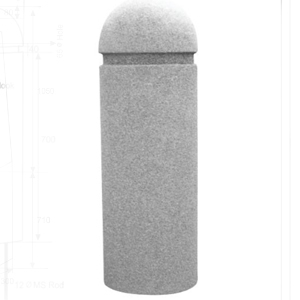 • The bollard is manufactured with cement method using FRP/steel moulds, so as to achieve shuttering finish.